Borel Estate Company owns and manages high-end commercial office buildings in San Mateo for the last 50 years. They were looking to take the guests experience to the next level by improving building wayfinding and creating a warm, elegant welcome for guests. 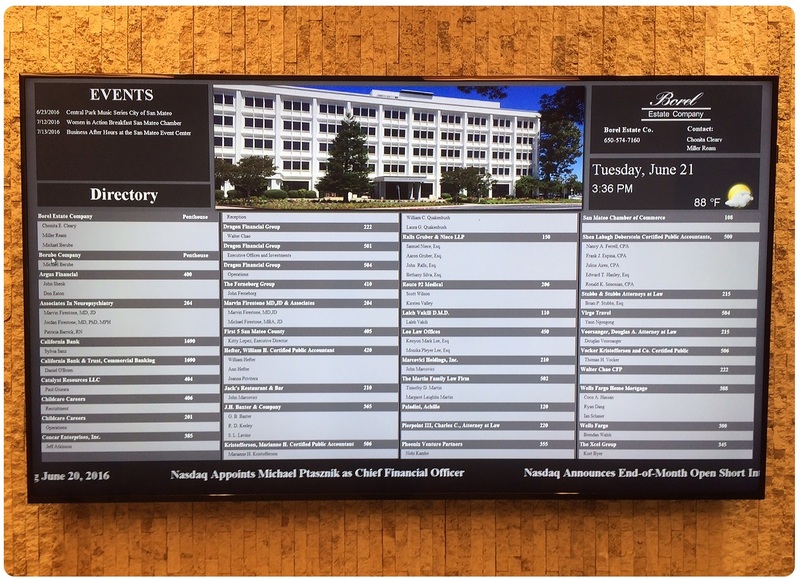 After partnering with BLR Sign Systems they now feature a professional digital directory that was designed to compliment the extensive lobby remodel. For over 40 years, BLR Sign Systems has been providing integrated visual communication solutions. For the digital portion of the Borel Estates project, BLR turned to wholesale turnkey solutions provider, DigitalSignBuilder.com, located in Milpitas, CA, who provided their 75” AdSlide™ Digital Directory. BLR Sign Systems engages customers, employees, and the public by delivering visual communications and inspiring physical environments. From dynamic and static signage to custom branding and marketing solutions, BLR Sign Systems help business put their message where they need it. Looking to learn more about digital directories? Ready to build your solution today? It's just 4 easy steps! Have questions about digital signage? Interested in becoming a partner or reseller?